Seasoned aquarium keepers often say they spend more time caring for the water in their aquarium than the actual fish. However, it’s a fact that a major part of caring for goldfish is quite simply just that: Taking care of the water quality. The rest almost just falls into place. A goldfish cannot live happily without you paying careful attention to water chemistry and cleanliness. It’s that simple. So, Do Goldfish Need A Filter? A Filter Reduces The Impact of Ammonia, Nitrites, and Other Harmful Chemicals. Two Basic Filter Types – Which to choose: Internal or External? Quick answer? YES! Absolutely they do. Maintaining optimum water quality is very hard in goldfish tanks unless you have a good filtration system. You will need to do very frequent, almost daily water quality tests with a good testing kit, and very frequent, high volume water changes without a filter. This is a lot of work and can take some of the fun out of goldfish keeping. Luckily, modern aquarium keepers have a number of filter options that make water maintenance far easier, but goldfish being such prolific makers of waste products do require special filtration to meet their unique needs. It surprises many people to learn that goldfish don’t actually have stomachs! They only have a simple digestive system that tries to extract as many nutrients as it can while food quickly passes through. This inevitably leads to much of what a goldfish eats being passed undigested right out the back, so they produce a lot of waste. Waste that then rots, creating harmful ammonia and other undesirable chemicals. This is the reason why you absolutely must have a filter, to help remove the large amounts of waste goldfish produce and process the harmful chemicals that the waste becomes. Goldfish are very hardy creatures and can survive in some pretty awful conditions. This is very unfortunate for them as it leads many people to believe they are easy to care for. No, correction, it makes many people believe they need little care at all! Very often goldfish left in unfiltered, dirty, low oxygen level water will still live for a good couple of years. And many people think a couple of years for a fish is normal. But living in effectively poisoned water that is hard to breathe, a goldfish will not thrive. They will have stunted growth, be lethargic, slow moving, suffer ill health and sadly they will die young. This happens a lot and is why many people think 2 years is a good age. Goldfish are known as incredibly messy fish, excreting high levels of ammonia and in emergency cases where there’s a surge, ammonia can kill off an entire tank of fish in a matter of hours. In a balanced and ‘cycled tank’ beneficial bacteria convert ammonia to less harmful nitrites, which is itself a harmful chemical and is converted yet again to the less harmful nitrates by yet more beneficial bacteria of a different kind. This whole process is known as the ‘nitrogen cycle’ and is an extremely important process for the health of fish in an aquarium. These beneficial bacteria responsible for the cycle colonize in areas where the water flow is highest and the oxygen content of the water is greatest. This is almost always within a filter. Not only this, but the added media provides an extremely large surface area on which these beneficial bacteria can grow, allowing large colonies to exist in a very small space. Without the naturally occurring biological filtration a filter provides, you would have to do huge water changes almost daily. A fish’s gills do basically the same thing as your lungs – they take in oxygen and get rid of carbon dioxide. Instead of getting oxygen from the air, gills are able to remove the dissolved gas from the water. Without sufficient circulation of water resulting in a greater amount of it reaching the surface for exchange of gasses (swapping oxygen into the water and carbon-dioxide out), fish can suffer from a lack of oxygen and potentially suffocate. One of the best ways to increase the amount of water coming into contact with the surface for gas exchange, is to have a high level of circulation in the tank. A filter provides exactly that. They have a pump able to circulate the water in the tank 5, 6 even 10 times over per hour. From solid waste your goldfish produce, to uneaten pieces of food, there are many solid particles that float around in your fish tanks water giving it a cloudy and somewhat dirty appearance. Tank filters contain ‘media’ (sponges, ceramics, carbon, etc.) that act as a trap to remove these solid particles and return the water to a nice, clear looking state. There are many different types of filter media available that clean the water in different ways, but that’s a large subject for a different article. There are many varieties and styles of filter available, but all fall into one of two very broad categories of either internal or external. Although opting for an internal or external model is a matter of preference, it being a power filter or better is of utmost importance. For dealing with the sheer amount of waste that goldfish create, ‘under gravel’ or ‘bubble up’ type filters just cannot cope. Besides a lack of power, under gravel filters aren’t suitable because goldfish like to sift through the substrate which can interfere with the functionality of this type. As the name suggests, internal filters are housed exclusively inside the aquarium. These were some of the first models available for aquarium keepers, have been successfully used for decades and are still very commonly seen today. Cheaper to both buy and run compared to externals. Quicker and easier to maintain. Take up less ‘room space’ than an external. Mostly, they look ugly inside the tank. With the exception of a couple of tubes, the entire filter is located outside the aquarium as the name suggests. After the water is sucked into a tube, it’s forced through the filtration medium and then released back into the tank via an overflow. Some external filters also come with a tank or “sump” that sits beneath the aquarium, making them far more effective but increasing their size considerably. Sump based filters are some of the best you can buy for the major benefit of creating an extra reservoir of water without requiring a larger aquarium. More water means lower concentrations of waste and chemicals. In general, external canister filters are the quietest type available, quieter than internal types of comaprable performance. External canister – or sump – filters provide far greater room for media inside, and so they can do a better job of biological and chemical filtration. More costly to buy and run compared to internal filters. Tend to be a bit harsh on fish swimming under the flow back into the aquarium. I’ve seen them dash smaller fan tails and goldfish. More time consuming to clean and maintain compared to internals. In our opinion, external filters are worth far more than the slightly higher cost when compared to internals. They do such a better job and this directly translates into better health for your goldfish! 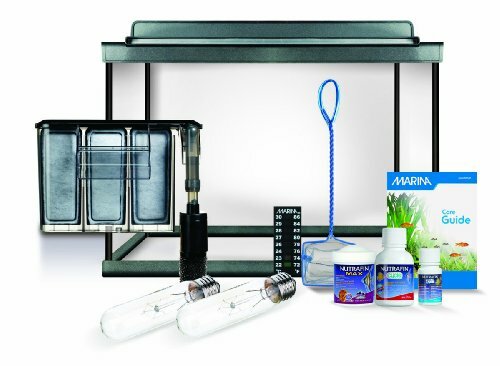 When you buy a “complete” aquarium kit, it will usually come with a cheap, budget filter in order to keep the kits total price down and make the aquarium appear to be good value. These cheap models are usually weak with very low flow rates and in most cases, you will not be happy with the performance when you try to use them with goldfish. They may be sufficient for a tiny number of tropical fish, but not for fish that are born to grow perhaps a foot in length, produce a lot of waste and require highly oxygenated water to support an active lifestyle. So more often than not, you will want to upgrade this filter to something a lot more suitable. Physical size isn’t the most important factor, it’s flow rate you need to concentrate on. The flow rate of a filter is the amount of water the pump can circulate and process each hour. It is a good benchmark to use for a filters suitability. For goldfish, you ideally want to aim for a model than can process 6x to 10x the amount of water in your tank per hour. So if you have a 40 gallon tank, you want a filter with a flow rate of 240 to 400 gallons per hour. You will read in many places the recommendation for a flow rate of 5x your aquariums size, but this is a little low. Filter media becomes clogged during use, causing the flow rate to drop over time. So the 5x volume flow rate soon lessens to 4x, or 3x even, and can very quickly become inadequate. So go bigger and feel confident that things are under control. Do goldfish need a filter? Yes, absolutely they do and it’s not even debatable. If you haven’t already, get a filter in that goldfish tank! One of the single most important things when it comes to goldfish care is trying to achieve optimum water conditions needed to keep your fish healthy and happy. Though goldfish are very hardy, they still have basic water quality requirements that are hard to achieve without decent filtration. Choosing a good filter helps control water chemistry, removes solid particles that make your aquarium look dirty, and allow you to reduce the frequency of water changes safe in the knowledge that your fish’s environment is being cared for. We at ItsAFishThing.com recommend external canister filters as being the best for a goldfish tank. They aren’t the cheapest but are reasonably priced, do a very good job and are easy for even beginners to set-up and maintain.